Today’s cruising fleet is made up of boats that are much larger than they were only just a decade ago. There is a lot to be said for the comfort and speed of larger cruising boats. And with all of the modern sailing gear and electronics available to us, big boats are much easier to handle than they used to be. But they are also much more complicated and thus more prone to need maintenance and repairs than small, simpler boats of yore. Small boat cruising now includes boats up to about 35 feet and it is worth noting that some of the largest builders of production sailboats have very few models in the 35 and under category that could be considered a boat you could live aboard. Smaller weekending boats and daysailers are more common in their range. The term “pocket cruiser” was coined a generation ago to identify the many small but capable cruisers that were launched at the beginning of the fiberglass age of boat building. Boats like the Pearson Triton, Tartan 27 and Catalina 30 were all considered perfectly suitable boats for a family to cruise for a week or an entire summer. The early fiberglass pocket cruisers were often designs based on hull shapes that had evolved from the days of wood construction so they had long overhangs, attached rudders and narrow beams. They were cramped and tended to heel over hard in a blow. If the leeward rail went under, you knew it was time to reef. Today’s pocket cruisers make the best use of fiberglass technology and offer much beamier and voluminous hull shapes with longer and thus faster waterlines. Boats like the Hanse 315, Beneteau 31, Jeanneau 349 or the Catalina 315 have the space inside of 40 footers from the old days. And the modern designs sail so much better, too. With roller furling genoas, full battened mainsails and cruising spinnakers, these small cruisers can really perform and will make your weeks on the water more fun than ever. Today’s boats are designed to sail fairly upright and use beam and even chines to provide a lot of initial stability. Sailing flat is more comfortable for everyone onboard and is faster than pushing the boat too hard and burying the rail. It means the boats can be sailed efficiently without heavy crew on the rail which means a couple can still get great performance without having to bring the whole neighborhood along. Plus, because the deigns are quite light, you end of reefing early and often, which takes the sweat out of managing your pocket cruiser when the breeze picks up. Some companies will even offer in-mast furling on their smaller boats, and that simplifies sailing even more. There are a lot of good cruising boats in the pocket cruiser category between 25 and 35 feet. Beneteau offers their 31, 35 and the First 30. For entry level cruising or for those who just like and want a modest size cruiser, these designs will get you on the water and really cruising at an entry level price. 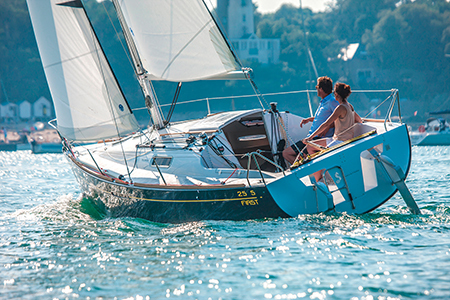 Beneteau’s sister company Jeanneau builds two designs in this category–the 33i and the 349–that are big little boats. They are beamy, have long waterlines and spacious interiors. The 349 that was introduced two years ago is a stellar performer under sail and has accommodations of a much larger boat. 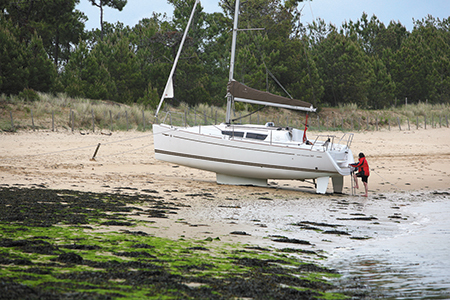 The thing about boats from the Beneteau Group is that owners benefit from the economies of scale such a large company can earn and from the huge dealer network. The boats hold their value because they are so well known and the quality is reliably consistent. Catalina’s 315, built in Florida, is an American classic among the fleet of pocket cruiser. Light and powered with an ample rig, the boat sails very well and is a real pleasure to handle. Catalina continues to build “American Style” into their boats so you will find solid joinery below decks and a lot of traditional features that set them apart from the fleet. Details like solid wood doors and louvers on cabinets turn the little 31-footer into a properly fitted out yacht. Com-Pac yachts from Florida offers the very capable Com-Pac 27 that is a truly proper little yacht with ocean sailing capabilities. Very solidly built and with a lot of traditional touches, the 27 would make a safe and comfortable entry level cruiser for a young family or a fine last boat for a couple who are aging out of big boat sailing. Like the Catalina, the Com-Pac 27 has a yacht finish that is both classic American styling and adds to the warmth and saltiness of the boats. Seaward Yachts are also built in Florida and are part of the Island Packet company with was recently bought by Darrell and Leslie Allen. 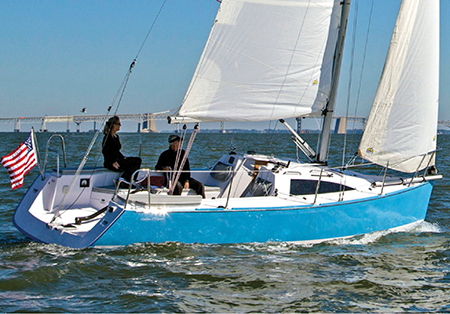 The Seaward 26 and 32 are unique boats with swing keels and kick-up rudders. The boats were designed in Florida for the shallows of Florida’s west coast and the Bahamas across the Gulf Stream and in those waters they are ideal. But, the designs have also proven popular in the Chesapeake Bay, Southern New England and the Great Lakes. The 26 is a roomy little weekender while the 32 is a cruising boat that can be your home for long cruises. Germany has become a world leader in production boat building in the last decade and three companies–Hanse, Bavaria and Dehler–have small cruisers that are modern pocket cruisers. The Dehler 29 is one of the most popular racer-cruisers in Europe with large well-established fleets that get together to both race and cruise. 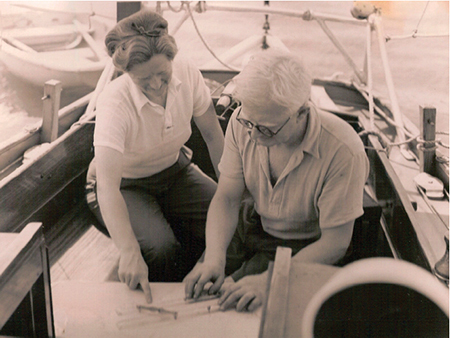 The Dehler brand is not that well known in North America but the boats and the builder behind them are first class. Hanse has quietly but steadily built a market for their boats in North America that now accounts for a significant slice of new boat sales. The Hanse 315 is a perfect little cruiser that is fast, easy to sail, roomy and affordable. It even has twin wheels. Hanse is a high volume builder but they do not skimp on materials, hardware and the quality of the workmanship. Bavaria made a big push into the American market over the last five years and is still trying to build market share. Their 33-foot cruiser, designed by Farr, is a huge 33 footer with a lot of interior volume, a large cockpit and wide open side decks. Bavaria builds a lot of value for the dollar into their boats. American builder J Boats offers several racer-cruiser designs that fit the pocket cruiser profile. 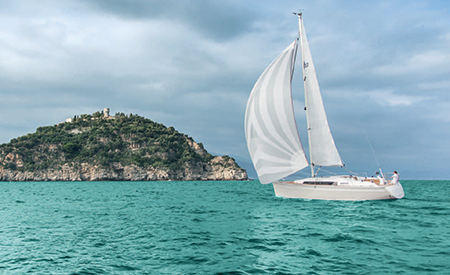 The J/97E that was introduced two years ago is a smart sailing, high quality boat that will acquit itself well on any race course and will double as a fun and comfortable cruising boat between regattas. Last but not least in this category, Tartan has three boats that will appeal to sailors who want that special combination of performance and cruising comfort in their under 35-foot cruiser. The Tartan 3400 is a beautiful, traditional cruiser that brings all that Tartan is famous for to the market for smaller cruisers. The 3400 sails sweetly and has very pleasant accommodations. The Tartan 101 and 115 started life under the C&C brand, which is also owned by Tartan. When the company decided to split off the C&C brand, they renamed and re-engineered the two designs to meet traditional Tartan style and construction. Both boats are fast racer-cruisers that have done well in fleets all around America. But, they are also great little cruising boats that will be the right combination of qualities for couples or family who want the best of both worlds. Since the early days of yachts there have been many great adventures and cruises in pocket cruisers so it is fair to say that it is not the size of your boat that matters, it is the size of your dreams. Here are some of my favorites. In the 1950, not long after the end of World War II, Susan and Eric Hiscock had a 30-footer built to a Laurent Giles design with a circumnavigation in mind. In 1952, they set off from England and spent three years sailing westabout via Panama, the Torez Strait and the Cape of Good Hope. Their voyage was a model of seamanship and prudent adventure and they laid a wake that many, many sailors would follow. Also in the 50s, Englishman John Guzzwell succumbed to the call of the sea. With a modest budget, he built a 21-foot Laurent Giles design that he named Trekka and in this little boat he set off from his home in British Columbia around the world. In 1959, after many adventures and several years, he returned to B.C. as the youngest solo circumnavigator in the smallest vessel to sail around the world. In the Sixties, a young Californian decided at the age of 16 that he thought it would be a good idea to sail his family’s 24-foot Lapworth sloop singlehanded to Hawaii. Along the way, he hatched the plan to sail his little boat around the world. Surprisingly, his parents went along with the plan and even more surprisingly the National Geographic agreed to take installments from him along the way. In 1970, Robin L. Graham returned to California as the world’s most famous sailor and the one who instilled visions of world sailing in thousands of young dreamers who had followed his trip. 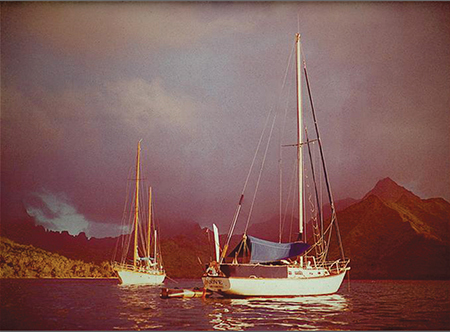 In the Seventies, Lin and Larry Pardey began their lifetime of seafaring aboard their 24 foot Lyle Hess designed Serrafyn. In this little cutter, they made epic voyage after epic voyage as they sailed eastabout around the world via Panama and Suez Canals. Their books and lectures inspired a whole generation of cruisers. Also in the Seventies, Yves Gelinas set off on his Alberg 30, Jean-du-Sud, from St. Malo in France with the intention of sailing non-stop around the world via the five great southern Capes. While he had to make a stop to repair his mast, he finished his circumnavigation in Canada having sailed 28,000 miles alone. Gelinas is the inventor of the elegant and simple Cape Horn self-steering windvane and his prototype steered his boat around the world in all conditions. 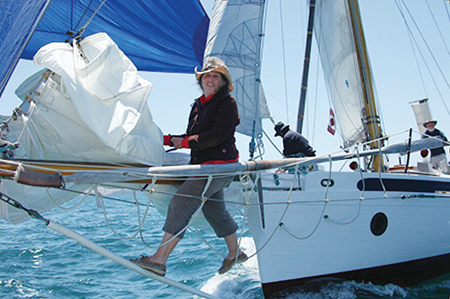 In the Eighties, young Tanya Aebi convinced her father that instead of attending university she would get a much better education if she sailed solo around the world. Her father agreed and took the tuition money he had saved and bought her a 26 foot fiberglass Folkboat design named Varuna. Learning as she went, Tanya spent two years cruising around the world in the classic tradewind route via Panama and Suez. She returned to her home port in New York City to a hero’s welcome and her book, Maiden Voyage, remains a best seller 30 years later. 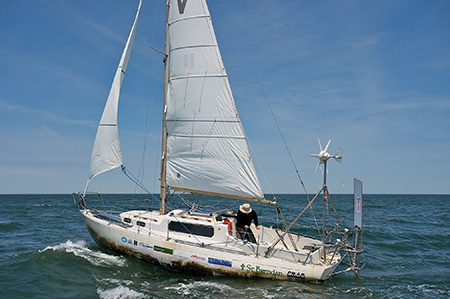 More recently, in 2011 and 2012, young Matt Rutherford sailed a borrowed, 27-foot Albin Vega sloop north from his home in Maryland to the Northwest Passage. His mission was to complete a non-stop circumnavigation of the America via the NW Passage and Cape Horn. The grueling and arduous adventures took him 10 months yet he prevailed. And along the way he raised $130,000 for a local Maryland charity. 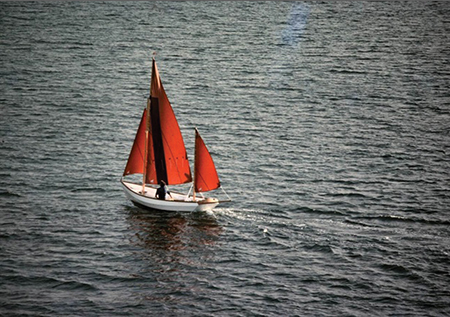 No one epitomizes the soul of the small boat voyager than American Webb Chiles. Since the 1970s he has made five and a half circumnavigations, mostly singlehanded. His boats have always been small but none smaller than Chidiock Tichbourne. This 18-foot open Drascome Lugger, is considered by most to be a fine daysailer and a good day boat that had no business blue water sailing. Yet, Chiles did indeed sail the boat around the world via the Panama and Suez Canals and he was even arrested in Saudi Arabia as a spy because authorities did not believe a man could or would sail such a boat along around the world. He is currently, at age 75, sailing a Moore 24 racing boat around the world and has thus far got to Australia. It is his hope, he writes, to complete his sixth solo circumnavigation before he leaves this planet.